If you’ve always wanted to interact with some of the world’s most exotic animals, now’s your chance! The Chattanooga Zoo offers a variety of WILD Encounters that give guests an up-close experience with red pandas, a two-toed sloth, Cotton-top tamarins, and more. 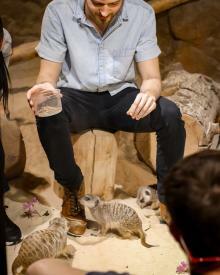 Each experience includes hand-feeding the animals and learning about their unique lifestyles from the Keepers. The 30 minute encounters range in price depending on which animal you want to visit and 10% of all funds from the WILD Encounter program go directly toward the Chattanooga Zoo&apos;s conservation programs and their efforts to save animals in the wild. There are plenty of fish in the sea, and even more to see at the Tennessee Aquarium! With a Backstage Pass, visitors can get a deeper look at what goes on behind-the-tanks in the River and Ocean Journey buildings. Enjoy VIP access to the River Journey building where you’ll check out the food prep room to see what everyone’s having for lunch and explore the Keepers Only area above the River Giants exhibit. Over in the Ocean Journey building, Backstage Pass holders can go above the penguin exhibit for a bird’s eye view of the Gentoo and Macaroni penguins, chat with SCUBA divers coming out of the shark tank, and even help the aquarists feed approximately 3,500 fish. It’s the perfect way to get up close and personal during a fun and educational animal encounter! For the true adventurer, a Wild Cave Expedition inside Raccoon Mountain is a must-do while in Chattanooga. Explore the limestone cavern in its natural state as you crawl and climb through a maze of formations and passageways. These expeditions aren’t for the faint of heart, and are known as some of the most rigorous excursions in the Southeast. 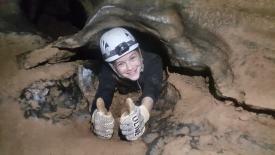 Whether you choose the Canyon Crawl, Waterfall Dome, or Gypsum Crawl Expedition, be prepared to get dirty and put your spelunking skills to the test! If you love caves and caverns but aren’t so sure about crawling through the mud to explore them, Ruby Falls’ Extended Cavern Experience is for you. This 2-hour excursion is led by a senior-level tour guide and gives guests extra time to discover Ruby Falls. Visitors can check out the variety of stalagmites and stalactites that can be found throughout the cave and spend additional time marveling at the 140-foot underground waterfall. You’ll learn about the geology and history of the cave and have plenty of time to take photos and ask questions in a smaller group setting. Channel your inner rock star and play some of the guitars that shaped musical history with a Player Experience Package at Songbirds. Home to a collection of 1,700+ rare and vintage fretted instruments, Songbirds offers a behind-the-scenes experience that can’t be found anywhere else. Guests will have the opportunity to take center stage and enjoy the thrill of playing a one-of-a-kind guitar like a 1958-1959 Gibson Flying V, a 1956 Gibson Les Paul Jr, or a 1956 Fender Telecaster. 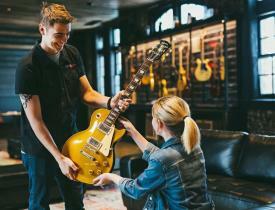 From the Jam Session to the VIP Studio Session, each experience can be tailored for every music lover.